In his between sets patter, Club MC Jeremy Sole thanks the Blue Whale audience for “not only showing up but being present“, reminding them (and us) that the two are very very different things. 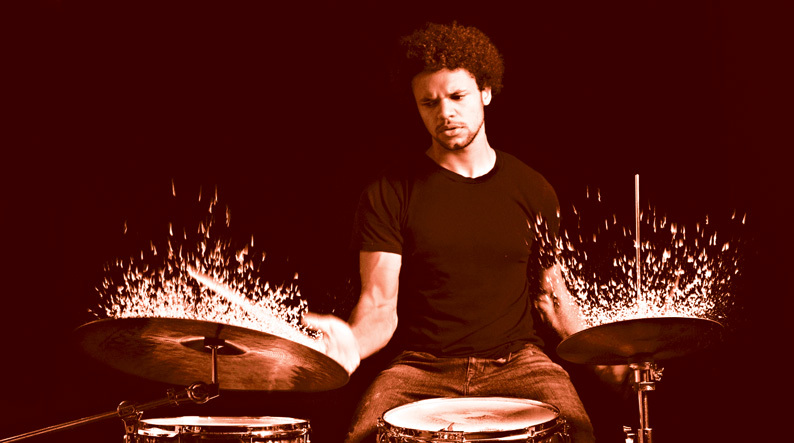 The same can be said of drummer Myele Manzanza and his ensemble for this electrifying live recording at the fabled LA club – OnePointOne (Live At the Blue Whale). The word ‘present’ applies here in all its forms – the performances are in the present (the now), Manzanza and the band present (bestow) us with their present (gift) of this music. And what amazing music it is – a feast of jazz-fusion flavoured beauty created before us in a time and space that seems endless. Manzanza’s debut album, 2103’s One, was a stunning introduction to the drummer’s great creativity, spirit of adventure and grasp of contemporary urban styles. The New Zealand born son of a Congolese drum master, Manzanza’s vision is one of virtuosic precision which never enslaves the groove – a very African approach: complex yet irresistable. But where One used an array of samples and had the slightly claustrophobic headroom of electronica, OnePointOne is open and organic, using Manzanza’s trio augmented by the Quartetto Fantastico string quartet and two vocalists, Charlie K and Nia Andrews. The difference is apparent on the live versions of two pieces which originally appeared on One – ‘7 Bar Thing’ and ‘City of Atlantis’. The former heats up under a bristling Mark de Clive-Lowe piano solo (acoustic piano is to the fore all across OnePointOne), whereas the latter, arranged by the Quartetto Fantastico’s Miguel Atwood-Ferguson becomes a languid, sun-dappled underwater cinematic experience. Jazz is also everywhere here, the spirit and the joy of it. Album opener ‘A Love Eclectic’ channels the spirit of John Coltrane with the bass of Ben Shepherd riffing a mutated version of the ‘Love Supreme’ bass hook (Shepherd’s solo, bonus track ‘Ben MF Shepherd’ is dazzling). The samba of ‘Absent Fade’ has Manzanza and de Clive-Lowe spinning each other off the dial, at one point tying the 4/4 bar into 7/8 knots. A high-point for me is Manzanza’s drum solo ‘Circumstances’. He tells a story and paints his canvas and takes us down the roads of his choosing – yes, I am mixing metaphors but Manzanza does all this and more. He is one of those rare players than can keep you totally engaged with only a collection of percussion instruments and a fair sprinkling of his own magic. 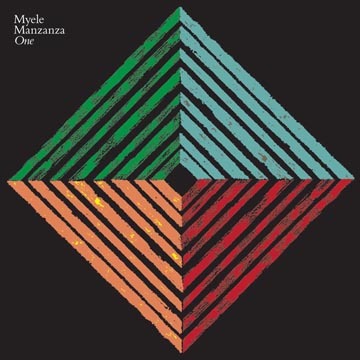 OnePointOne (Live At the Blue Whale) is sprinkled all over with that magic and has made me a fan all over again of Myele Manzanza, despite his debut and this current album being remarkably different from each other in approach. And yet they are held together in style by Manzanza’s skill, vision and sense of deep beauty. I deeply recommend it.